Your Walls' Lucky Day... 33% Off Dry Erase Paint Sale. Happy St. Patrick's Day! Your Walls’ Lucky Day… 33% Off Dry Erase Paint Sale. Happy St. Patrick’s Day! Transform your walls at a 33% discount for a limited time! That’s right! 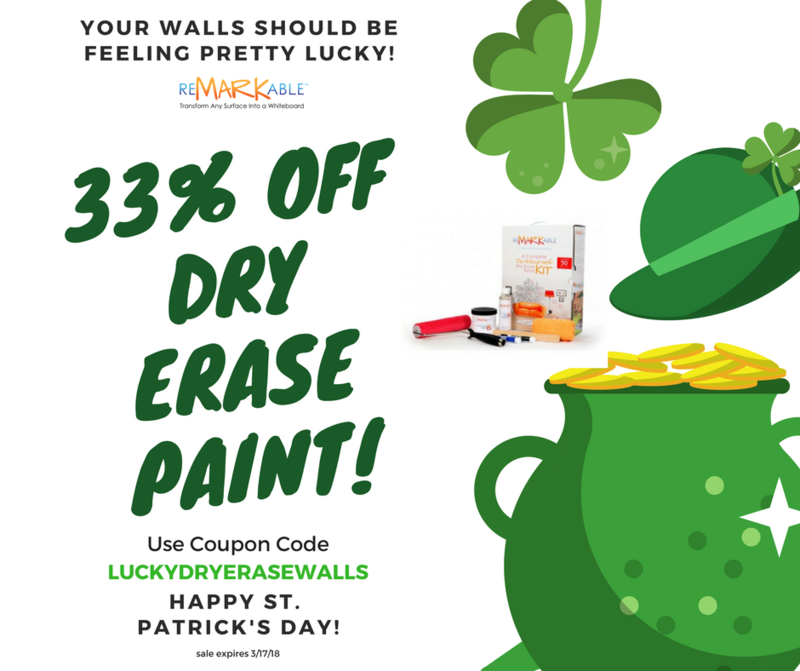 Now through St. Patrick’s Day, 3/17/18, you can score dry erase paint for your office, conference rooms, classroom or home for 33% off normal price (on all dry erase paint orders $444 or more). This coupon is almost too good to be true – pass it on to your friends, colleagues, vendors, and customers. Everyone could benefit from some extra whiteboard space, and a big collaboration, productivity, creativity boost in their lives and businesses! Click here to shop whiteboard paint kits.